Mac using musicians are always looking for the best sound quality when recording music, whether it's for instruments or vocals. New releases from AKG at the Musikmesse trade show in Frankfurt, Germany on Thursday give you a couple of new options. 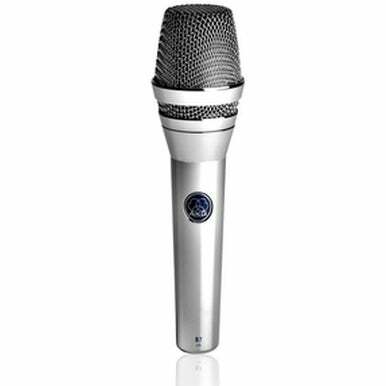 The AKG D7 Limited Edition microphone. The first mic is the Perception 820 Tube, AKG's new flagship microphone. The 820 features a 20dB attenuation pad and a low cut filter giving it a wide range of uses, including vocals, brass instruments, electric guitar amps and overhead micing. The 820 also has a selection of 9 different pickup patterns from omni-directional to cardioid to figure eight. The second mic is AKG’s new reference dynamic microphone, the Limited Edition D7. The D7 features an integrated high-pass filter that eliminates all handling noises. The mic also has an acoustical designed inner windscreen that provides users with additional protection from unwanted interruptions in live applications. Pricing for the mics was not immediately available.